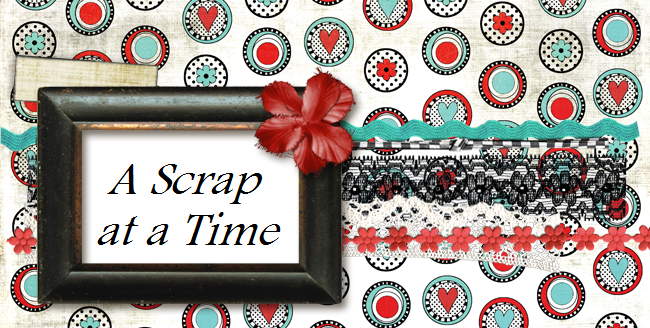 A Scrap at a Time: Can you tell? Can you tell this is 2 pictures? I'm sure many of you have kids that don't cooperate when you want them to. Mine are pros at this. I so wanted a picture of the boys standing on either side of this sign near the Pirates of the Caribbean ride, but they both got big attitudes and the two half way decent pictures I had kept cutting one of them off since I was so frustrated trying to get the shot. So I cut the end off one picture and layered the other one in to get both boys in. Then a little trimming of the edges and some ric rac along the bottom to hide a small gap and voila, one picture. I used a sketch from the Scrappiest.